Beloved and I had dinner at Hanamaruken a couple of days ago. This relatively new ramen place opened its doors at Trinoma’s 2nd floor alfresco area by its Mindanao/North Avenue entrance. Some of our friends have already been here and have been recommending this place, so we opted to try it out. There was a small queue when we went, but it went by fast. We were presented with a modest menu of ramen, rice bowls, and sides. Their main featured dish is called their Signature Happiness Ramen (480 Php), which I ordered. Beloved, the spicy food enthusiast, ordered their Spicy Tobanjan Ramen (320 Php). Because there’s no eggs in their ramen by default, we also got a single order of their Aji Tamago (50 Php) to share between us, as it’s sliced in half. 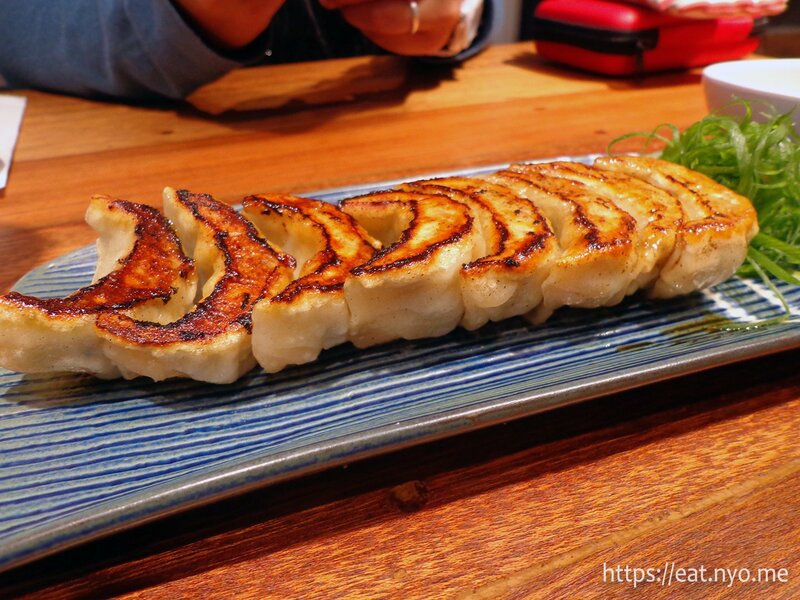 We also ordered their Gyoza (150 Php) to share as well. Their Gyoza was quick to arrive. It’s quite comparable to the usual dumplings we order. What’s a bit different is their sauces. Their gyoza sauce was quite vinegary and the chili oil was very, very spicy that it hurt my tongue. 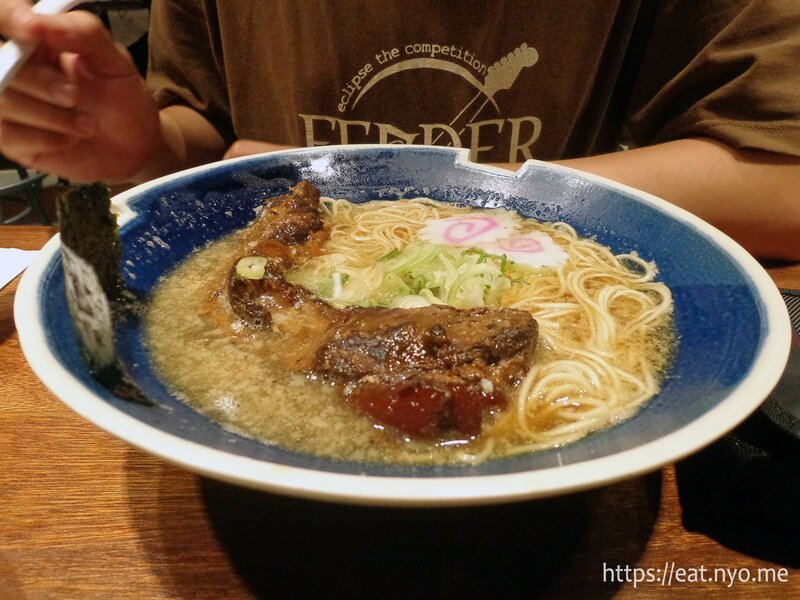 Their Signature Happiness Ramen has an entire slab of pork rib on top. Aside from that, there’s a lot of noodles in the bowl, which were nice and firm, and a couple of naruto slices as well as some spring onions. While the broth tastes okay, a bit on the creamy side, the main star here is the pork. It’s extremely tender, down to its gelatinized bones and tendons that you can easily bite into—the first bite was indeed Happiness. However, like most cases of happiness, it slowly fades down as I got cloy from the pork, and the last few bites were a bit of a chore. It didn’t help that the broth was quite rich too, and my tongue needed a break from the rich flavors. 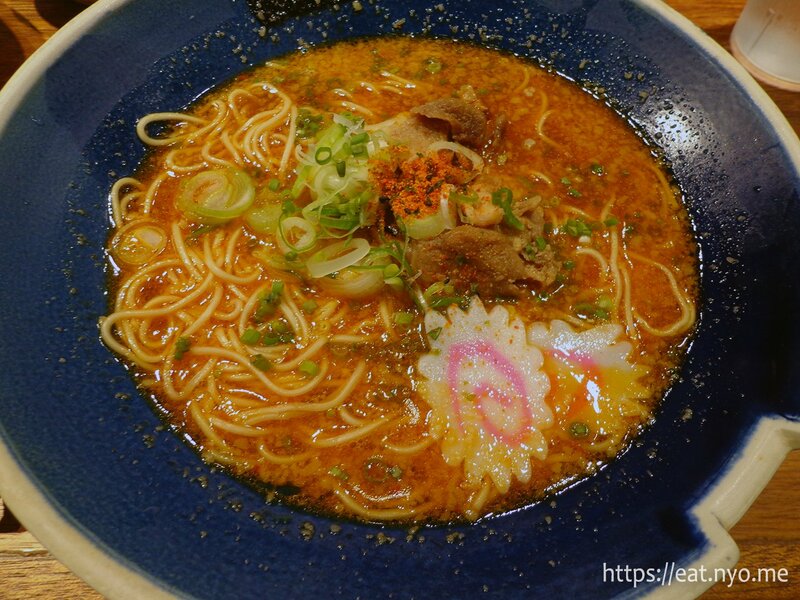 The Spicy Tobanjan Ramen had chasyu slices instead of pork rib and a much more sinister red broth instead of the usual tonkotsu color, forewarning its spiciness. The other toppings were the same—noodles were the same firm ones, and, like mine, there’s a lot of it relative to the amount of broth. Beloved found the soup a bit too rich yet not as hot as she would’ve liked. Also, the pork slice wasn’t as tender as the rib from my Happiness. We added the Aji Tamago to our ramens, which, while soft-boiled nicely, were just drowned out by the already flavorful broths. I think this is the most generous ramen place we’ve been to so far in terms of what you’re getting and relative to the competition. There’s a lot of noodles and meat, although maybe not as much broth. We found the flavors a bit too rich, cloying, and/or salty to our liking, but our appetites were definitely appeased. Hanamaruken was definitely worth the try. Budget: 400+ Php per head. Recommended for: Extremely tender pork rib lovers. Not recommended for: Herbivores, dry food lovers. Smart nomnomnom tip: Bring a date, get their Happiness and some other dish and share the rib to avoid cloying.